(VEN) - Themed “Hanoi-The quintessence of traditional crafts”, the 2016 Hanoi Traditional Craft Village Tourism Festival took place at the Imperial Citadel of Thang Long between September 29 and October 2. The 2016 Hanoi Traditional Craft Village Tourism Festival attracted representatives of handicraft villages, artisans, craftsmen, traders and tourist companies. According to the organization board, this year’s festival brought together about more than 200 booths, including 60 booths from 40 traditional craft villages and businesses in Hanoi, 40 booths from 22 cities and provinces throughout the country, 50 booths from tourist companies and donors, five booths for Hanoi’s tourism promotion zone and 63 booths from other craft villages. In addition, food courts and folk game zone were also present in the festival. A series of activities were organized in the framework of the festival including exhibitions, cultural and art performance, making traditional handicraft products, folk games and a workshop on Vietnamese craft villages, tourism development and international integration. To make a strong impression on visitors, the 2016 Hanoi Traditional Craft Village Tourism Festival was designed to create characteristic cultural imprint of the capital, expressed through unique features from the gate and main stage to exhibition booths as well as cuisine. According to the Hanoi Department of Tourism’s representative, with the theme, “Hanoi-The quintessence of traditional crafts”, the 2016 Hanoi Traditional Craft Village Tourism Festival contributed to introducing, preserving, honoring and developing traditional crafts associated with the tourism of Hanoi and other provinces and cities throughout the country. This year’s festival offered an opportunity for craft villages and businesses to exchange, cooperate and develop traditional handicraft products and more. In particular, the festival showed tourism products and specialties to domestic and foreign visitors. 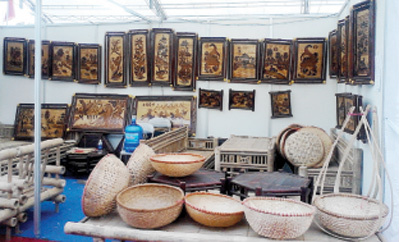 The 2016 Hanoi Traditional Craft Village Tourism Festival included some main areas featuring Van Phuc Silk Village and Bat Trang Ceramic Village, hands-on experience on making craft products in seven craft villages, a documentary and photo exhibition on traditional craft villages and an art installation area.